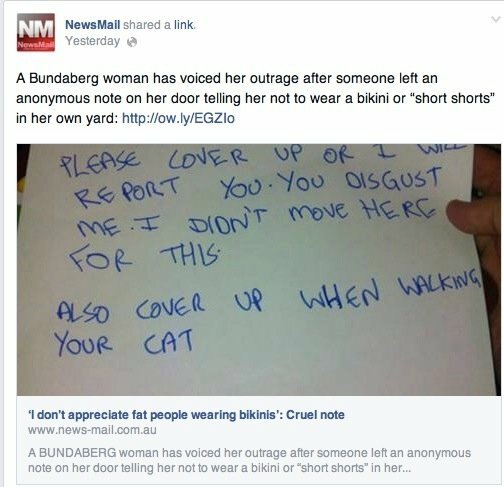 Nasty note asks Queensland woman to cover up. This note was pinned to her door. "You disgust me. Cover up"
The woman has the nasty note stuck to her door. You ready for this, because it is going to make you want to scream. Well shake both fists folks cause this one is a cracker. A Queensland woman has received an anonymous letter from a neighbour asking her to “cover up” while she is gardening. 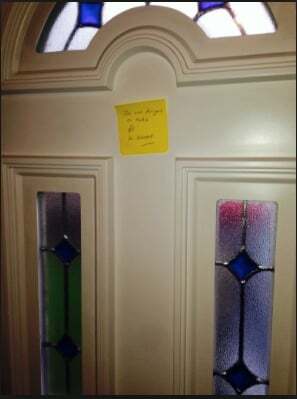 The unidentified woman from Avenell Heights near Bundaberg discovered the vile post-it note stuck to her front door. The note, which was unsigned (Of course. Coward.) left the woman shocked. She said she felt uncomfortable and horrified when she read the vicious body shaming words. The Bundaberg woman told the News Mail that at first the note made her ashamed – that she couldn’t do what she wanted in her own space. The majority of commenters on the News Mail Facebook site said that they supported the woman’s right to wear whatever she bloody well wanted in her own home OR when walking her cat. 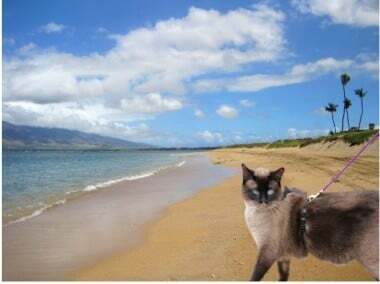 And that the anti-cat people should be damned – if she wanted to walk her cat wearing a bikini then no nasty note should put her off. Anyone dissin cat walking has to deal with me. Only a few weeks ago Mamamia reported on a young mother, again in QLD was on the receiving end of a note telling her to keep her baby quiet. And then last week a 46-year old woman (again in QLD) found herself a victim of beach body shaming after being told she was “too old” for a bikini. Julie Cross in her bikini. Julie Cross fought back by posting a picture of herself in a bikini in order to stand up and say she was proud of how she looked. Three incredibly distressing examples of cowards hiding behind nasty notes and words to bully. We can’t write back personally to the bully who shamed the Bundaberg woman as the low life has hidden behind their post-it note persona. All we can do is shake our fists in rage, shake our heads at the nastiness and hope the woman who received the note reads our messages of support and solidarity. Let’s hope this is the last of the nasty note stories we hear this year.